How do we protect and restore connected habitat so that wolves, mountain lions, and other wide-ranging species that do not prosper in close proximity to humans have populations linked throughout North America? How do we do this in the simplest, most practical way? In other words, what is the minimum required to rewild North America? Aldo Leopold warned that the first rule of intelligent tinkering is to keep all the cogs and wheels. For rewilding North America, we need to find or restore some of the cogs and wheels we’ve already tossed into the dustbin. We also need to redraw the lost blueprint of a wild North America so we know how to put the cogs and wheels back together again. 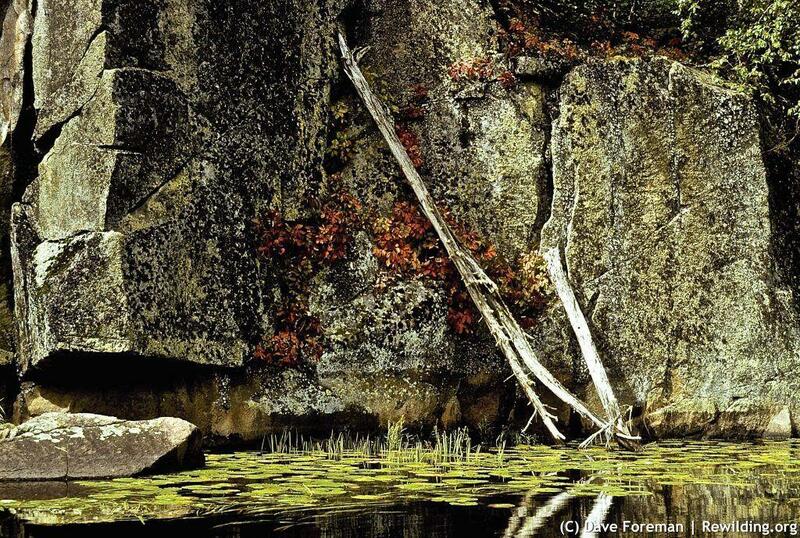 From the standpoint of continental conservation and rewilding, The Rewilding Institute looks at North America in shades of landscape permeability: the degree to which the land is open and safe for the movement of large carnivores and other wide-ranging and sensitive species between large core habitats. In much of the tundra and boreal forest of Alaska and northern Canada, the land is mostly wild, with essentially undisturbed native vegetation, landscape permeability, and all native species, including carnivores and large ungulates, in something close to their natural populations. However, even here, poorly regulated trapping, wolf extermination programs, and excessive subsistence hunting have altered the natural system over wide areas. Moreover, oil and gas exploitation, mining, and boreal-forest clearcuts as far as the eye can see have ripped away the wildness of the land in many places. Indeed, Alberta’s nineteenth-century-style resource looting is being carried out today with head-spinning gusto and could largely fracture landscape permeability in the northern (boreal) half of that province. South of the boreal forest, most of western Canada and a good bit of the western United States retain landscape permeability to a fair degree. For example, mountain lions are able to move through the majority of the region north to south and east to west. Were they not shot on sight by wannabe frontiersmen, wolves could similarly travel over the same territory. Permeability is not so good for grizzlies, wolverines, and bighorn sheep. To a lesser degree, parts of the Upper Great Lakes region, Florida, Appalachians, northern New England and New York, and the Canadian Maritimes retain some landscape permeability and could have it restored to a higher degree. Some mountainous and tropical forest regions of Mexico and Central America also retain fair landscape permeability. Throughout these places, however, there are large domesticated regions and major barriers to wildlife movement. Nearly everywhere, wildness wanes: the land becomes more domesticated and less permeable to wildlife movement. Nonetheless, the regions above are the parts of North America that realistically could be considered for rewilding (or kept wild). Public lands or large private landholdings, ruggedness of terrain, natural vegetation, low road density, and low human population density generally characterize the areas most suitable for rewilding. This does not mean that conservationists should ignore the more domesticated and fragmented parts of North America. The existing approach to nature reserve protection and restoration must continue, with an emphasis on ecosystem representation and special elements of biodiversity, and a more ambitious vision. Domesticated regions of North America, such as the Tennessee River system, hold much of the most imperiled biological diversity on the continent. The concept of habitat corridors through a hostile sea remains highly applicable to such areas. The approaches for conservation area design shift from areas of high domestication and low permeability to areas of low domestication and high permeability. Additionally, there may be other areas, such as the northern Great Plains, that could be rewilded in the future. But, it is simply common sense to acknowledge that wolves are not soon going to be chasing bison across Iowa or north Texas, no matter how much we may dream. 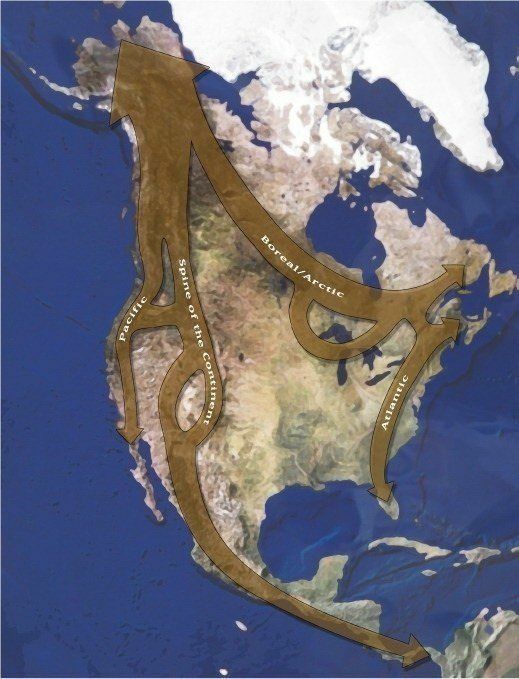 The Rewilding Institute believes that the minimum for rewilding North America is protection and restoration of Four Continental MegaLinkages as shown in Map A.
Pacific MegaLinkage: From the high mountains of northern Baja California up the southern Coast Range to the Sierra Nevada and Cascades, and then up the Coast Range of British Columbia into southern Alaska. Spine Of The Continent MegaLinkage: From the volcanic cordillera of Central America up the Sierra Madre Occidental to the Rocky Mountains of the United States and Canada, then into the MacKenzie Mountains of the Yukon and across the Brooks Range of Alaska. Atlantic MegaLinkage: From the Everglades to Okefenokee, and then to the Appalachians (including the geologically distinct Adirondacks) into the Canadian Maritimes. Arctic-Boreal MegaLinkage: Northern North America from Alaska across to Quebec and Labrador with a dip down into the Upper Great Lakes. Map B is a schematic map of the Pacific and Spine of the Continent MegaLinkages in the western United States linking the largest wild cores and core complexes. These existing and proposed protected areas are made up of wildlands of 500,000 acres or more with relatively insignificant internal fragmentation; lightly traveled roads, campgrounds, national park facilities, ranch headquarters, and the like may be present. Separate core complexes are shown adjacent when more troublesome barriers—such as heavily traveled roads, villages, agricultural landscapes, intensive timber cutting—lie between them. The linkages include many smaller cores and core complexes. These linkages seem the most logical method of connecting the cores: the lands are reasonably permeable with mostly natural vegetation, they comprise a high percentage of public land or private land in conservation ownership, and they are of continental importance. 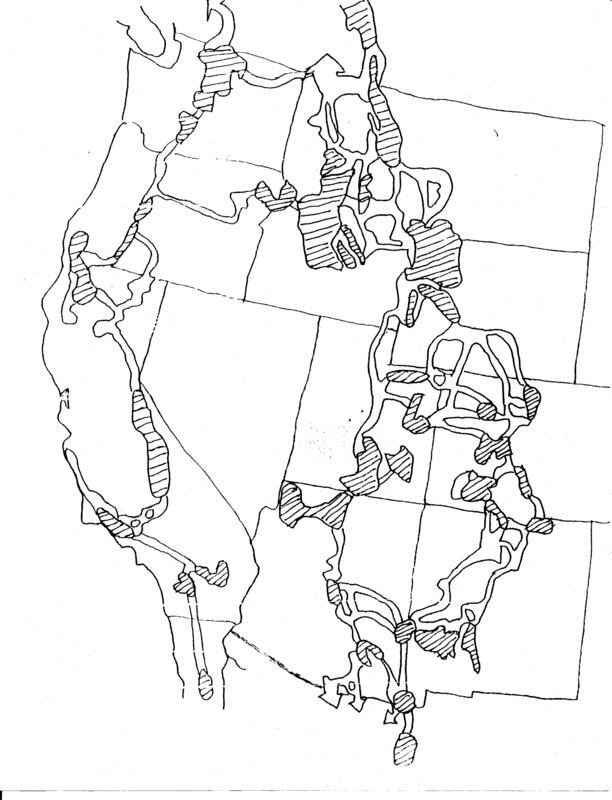 The map shown here is a bare bones, simplified map that leaves out some less vital linkages, which have been or will be included in more detailed wildlands network designs, and that leaves out much of the landscape permeability on public lands that will provide essential connectivity. Also left out are many large cores and core complexes along with linkages that will form wildlands networks for parts of the West that, while extremely important in and of themselves, are not as critical for continental wildlife movement. This map is of the western United States and adjacent Mexico and Canada only, because necessary information does not yet exist to do equally accurate maps for Mexico and Canada. The map is illustrative and tentative, not definitive. The Atlantic MegaLinkage is similarly designed, but not mapped at this time. It uses cores and core complexes of 100,000 acres or more. In general these cores are less wild than those in the West and will require more restoration, as will linkages between them. For a list of possible cores for the Pacific, Spine, and Atlantic MegaLinkages, CLICK HERE. The Arctic-Boreal MegaLinkage is unmapped because of the lack of a comprehensive protected areas proposal in Canada at this time. Canadians are now working on a vision to protect the boreal forest and for additional protected areas on the tundra. As they are developed, maps of the other MegaLinkages will be posted here. With the Pacific, Spine of the Continent, and Atlantic MegaLinkages running south-north, they not only follow the natural lay of the land, but allow for species movement north in response to climate change. Although the tundra and the boreal forest are the wildest and most intact part of the North American Wildlands Network, they may not be so for much longer. The planned destruction and domestication of Canada’s boreal forest by vast and widespread timber mining (it isn’t forestry) and oil, gas, and oil sand extraction is one of the most important conservation issues in the world. Boreal forests are particularly vulnerable to industrialization because they have very low productivity and take a long time to grow to maturity. The Arctic tundra of the Northwest Territories and Nunavut are wide-open for a diamond mining frenzy. As we conservationists work on rewilding other parts of North America, we must work very hard to keep Canada’s north wild. The same is true for Alaska. The MegaLinkage map is based on a variety of proposals and research by conservation groups, conservation biologists, and government agencies. Nonetheless, it is rough. The Rewilding Institute plans to hold meetings for each MegaLinkage to map them in greater detail and to develop strategies to advance protection and restoration of the MegaLinkages. Check this website for updates. John Terborgh and Michael Soulè, “Why We Need Mega-Reserves—and How to Design Them,” Chapter 8 in Continental Conservation.